Offered year round and scheduled at your convenience. This private half day Making Milk Soaps Workshop is geared to the soap maker who has had some experience making cold process soap on a regular basis but who has little or no experience incorporating milk into the the mix. 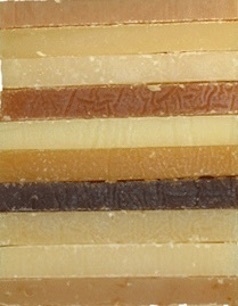 This new component adds a variety of new or enhanced characteristics to any soap produced. However, the use of milk requires special handling which must be learned by doing. This workshop addresses the major requirements to get the relatively new or seasoned soap maker off and running in the production of milk enhanced soaps, while providing a quick review of cold-process soap making and related safety procedures. We teach the Cold Process of soap making which is the old-fashioned process that combines sodium hydroxide with fats and oils, and creates a soap that cleans with kindness due to the glycerine created and retained in the soap. (2) Do not sign up for this class unless you have previous experience with cold process soap making. We offer one day and three day introductions to soap making classes if you are just starting out, and would be happy to help you. • Workshop Workbook including classroom lecture notes, helpful online resources, and recommended soap making suppliers. A tour of Soap Shed production areas, soap molds, drying racks, cutting, packaging, retail customer shop, and shipping areas will be provided. • You will make your own batch of soap incorporating milk. A Soap Shed tour will introduce you to the processing phases, where we evaluate soap to determine its readiness for cutting, and demonstrate how to use a variety of soap molds, log splitters and different size bar cutters. We’ll show you our current drying rack rooms (as well as different methods when our business was smaller) and explain our curing process. We will provide all Supplies and Materials you need for the workshops, including safety goggles, gloves, aprons and molds. Please wear old clothes so if you splatter olive oil or butters on them, you won’t be heartbroken. Long sleeves, full length pants and closed toed shoes protect your skin best so please wear them. You will receive a notebook with written material on each topic we cover, along with supplier information and recipes to get you started. After receiving safety instructions and guidance about the protective gear you should always wear (safety goggles, etc), you must sign a Liability Waiver for us before being allowed around ‘lye’ and the production area. A date and time is agreed up after you register for this class. We'll be in touch to make arrangements. Three hours, morning or afternoon. Tim Tyndall started making cold process soap in 1998, and is a science professor by education and training, having been a science teacher and college administrator for 30 years in chemistry, biology, botany and health sciences. 'Dr.T' has been teaching handmade soapmaking weekend classes and week long classes at the John C Campbell Folk School in Brasstown, NC for over ten years. Karen Wylie created The Soap Shed to sell soap wholesale, consignment, at craft shows, retail shop, and from the soapshed.com website. She also coordinates production, quality control and packaging. In response to requests for soapmaking demonstrations, The Soap Shed opened its doors to the public in 2000. During the Blue Ridge mountain tourist season (May-October), visitors can see soap made and select from 150 varieties in their retail shop. Prior to creating The Soap Shed, Tim & Karen were business educators and consultants to clients in the furniture & textile industries. When these industries literally left the USA in the mid 1990s, Tim and Karen reinvented their lives and livelihood by creating The Soap Shed at midlife, at ages 52 & 40, respectively. Their unusual backgrounds - combined with their first hand experience in creating and running a handmade soap business for 16 years - provide Tim and Karen with unique perspectives on making and selling handmade soap. Register for this Workshop by putting it in your shopping cart and checking out. You may also pay by check or money order in the amount below and mailing it to The Soap Shed, 179 Meadow View Road, Spruce Pine, NC 28777. Please feel free to contact us at 877-404-SOAP with any questions you have. And please read our cancellation policy below before signing up. If you give us less than 7 days notice or just don’t show up for the workshop(s), a $100.00 administrative fee will be charged. You are welcome to send someone else in your place if you cannot attend yourself. A list of private and chain hotels and motels within 20 miles of The Soap Shed will be provided when you register. Asheville and Boone are great towns to stay in, but they are an hour's drive from Spruce Pine. We are located in Northwestern North Carolina, tucked up close to the Tennessee state line. We are one hour east of Asheville, one hour south of Boone, 2 hours north of Greenville-Spartanburg SC, and 2 hours northwest of Charlotte. For anyone flying in, Charlotte-Douglas Airport and Greenville-Spartanburg Airport are larger airports than Asheville, but the Asheville Airport is about an hour and 15 minutes drive from here. Because of the distance, we regret we are unable to offer airport transportation assistance. Car rental from Asheville is usually far less expensive than limousine.